Durban – by Dave Macleod. 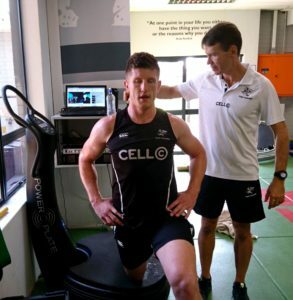 As they continue their challenge for the Currie Cup title in 2018 the Cell C Sharks players are working with lead biokineticist Jimmy Wright to harness technology to keep themselves prepared for the physical demands of the competition. Keeping up with the latest trends in preparation, performance and recovery are things, that Wright says, the new generation of players are all embracing as part of their professional approach to managing their careers. 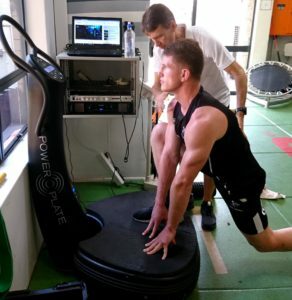 Wright is a passionate believer in using technology like the Power Plate vibration technology to optimise training and preparation, and says once the benefits become obvious, players make use of the equipment as a fixed part of their training routine. Wright cited an example of a player that battled to get full leg flexibility due to fascia tightness. A few minutes on the Power Plate released that tightness and for the first time the player was touching his toes. “We want to make sure there is transfer from the gym to the rugby field,” explained Wright. “Every exercise has to be supportive to what happens on the rugby field and increase resilience to possible injury. “When it comes to using technology like the Power Plate we achieve major gains by showing the players ways to improve their tissue quality, joint range of movement and how to activate muscles. “When players buy into innovation and better ways of training, our jobs become easier. Instead of spoon-feeding a player by putting up a programme for them, we teach the players how their bodies work and why their bodies respond the way they do. “Player longevity is all about not getting injured. The players naturally want to buy into that and Power Plate helps us with that,” he said. Wright said that the vibration technology benefits start with improved mobility. “What we are trying to achieve with any training programme is to bring stability to movement. “Rugby challenges stability. We divide the body into three major pillars – the core, the hip and the shoulder – if we work at improving stability in those pillars, then we see movement happening more efficiently on the field and running happens faster and the risk of injury is reduced. “But at the same time we want to make sure the joints remain flexible. Training can result in joints locking up because training muscles can shorten a joint’s movement capacity,” he said. “We can identify the muscles that shorten and the Power Plate helps to maintain full range of movement in the joint. “For example, locks often battle with tight muscles because they have long levers and tight hamstrings, and they find it difficult to achieve better hip range” he said. “We use a two minute Power Plate routine at a low frequency that releases the fascial system top improve hip joint range of movement. Wright said the technology was rewriting the ways athletes warm up before training and competition. “”The old ways of warming up have changed. These days we like to spend the first thirty minutes before a field session indoors,” he explained. “We get the players’ shoes off to activate the fascial lines, starting at the bottom of the foot to the top of the head. “Part of that is done on the Power Plate, together with specific additional movements, each with a particular pre-habilitative purpose. 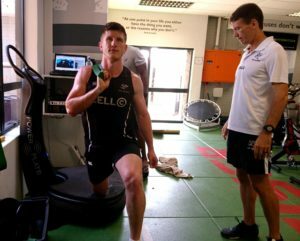 Wright said that the new generation of professional rugby players coming through the ranks were harnessing the advantages of technology like the Power Plate vibration systems to enhance their abilities and prolong their careers. 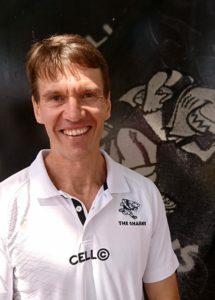 “It is making our jobs easier and the benefits start to become obvious to the athletes,” he added.